We arrive in Bogota on July 4th. It’s one of those very early morning departures which always seem like a good idea at the time of booking the flights but miserable at the time of flying. And we’ve been to the airport at 4am the morning before, so we’re doubly miserable. However stepping outside at Bogota is a breath of fresh air (we’re expecting double negative air : the combination of the altitude and pollution, but we can’t feel either). Customs and passport control is a breeze, and someone from our hotel is waiting for us. 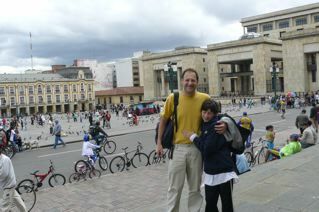 Usually we get our own way to the hotel, but we’re concerned Bogota might be too complicated so we ask the hotel to meet us. As we’re staying in the La Candalaria district, this proves to be very worthwhile as no taxi driver is able to find our hotel during our stay. Outside the airport, there is frenetic activity, like you may expect in the developing world. We have our first encounter with an unusual Colombian sight – vendors selling tiny cups of coffee from a heated flask. We will see this hundreds of times over the next two weeks. Our hotel is Colonial Abadia. I’ve read mixed reports but we like it. The location is terrific, in the heart of La Candalaria.The area buzzes with atmosphere and action during the day but is deserted at night. As we arrive hungry at 9.30pm we have to search a little nervously for some place to eat. I find it one of the great phenomena of travel that almost invariably when you arrive at a new place you feel totally lost; some time later – it could be just one day- you get your bearings and everything becomes more obvious. Anyway we find a place and eat well. Abadia Colonial Hotel is very pleasant. We’ve read mixed reviews so we’re a little nervous but there’s no need to be. The hotel has decent sized rooms, lukewarm shower water and a forgettable breakfast. If you’re travelling with kids, as we do, you’ll probably have to supplement breakfast (a piece of fruit, eggs and coffee or hot chocolate) with something else. Luckily within the next 3 blocks, there are all sorts of tasty treats available either in cafes or being sold on the street. And if you’re not that excited by the coffee (usually very weak with a lot of milk) there’s a Juan Valdez cafe (a Colombian Starbucks-like establishment) nearby. 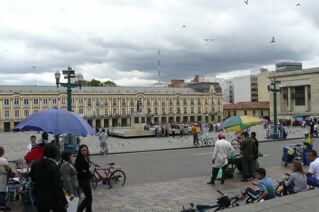 Our first day, being a Sunday, we stroll around the Plaza Bolivar area. We’ve arranged our itinerary so that we’ll be in Bogota on a sunday. If you’re going to Bogota, you must be there on a Sunday, as most city streets are closed to cars until early afternoon and are taken over by walkers, joggers, families, cyclists, roller bladers and the likes. It’s an awesome sight, especially combined with vendors of every type hawking just about anything imaginable (or not). And now we appreciate what a great location we’re in because we’re five minutes from Plaza Bolivar, the heart of the older part of the city. There are imposing buildings and monuments all around, very carefully guarded by security personnel. But the atmosphere is carnival like and we spend hours meandering the streets. In the afternoon we hook up with friends in North Bogota area of Zona Rosa. It’s very fashionable with smart-looking shops, restaurants and bars; in fact everything we’re not very excited by.We eventually land up a Crepes and Waffles, a chain restaurant serving what you would expect but real food too, and a very good place to go with kids. Of course the taxi driver cannot find our hotel – he can’t even get to Plaza Bolivar- but eventually he gets close enough and thanks to all our walking earlier we find our way back. It’s been a great day in a wonderful city.